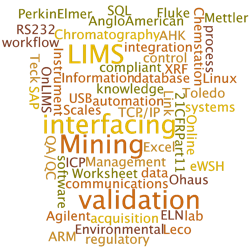 The Online ELN Worksheet is a flexible and advanced Instrument Interfacing System designed to integrate the laboratory at the bench level and to standardize all analytical techniques (SOP’s). It handles all the complex raw data manipulations allowing only clean and formatted final results to be forwarded to any Database or LIMS system. 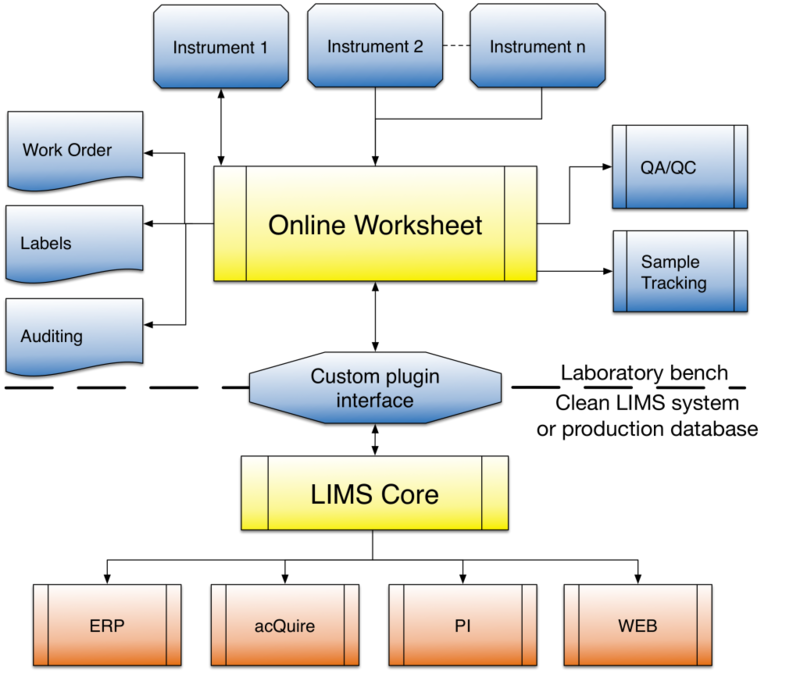 The Online ELN Worksheet is a perfect Lab Execution System (LES). Companies with more than one laboratory and several branches often have very complex LIMS because the LIMS structure is often different in each laboratory or branch. However, a close look at the LIMS system reveals a common pattern at the lab bench level, reflecting the production of the laboratory (Figure 1). All what is needed to simplify the LIMS structure is to separate business level information (LIMS) from the laboratory production level information (Online ELN Worksheet) (Figure 2). Standardization then becomes easy to implement. The laboratory production is standardized regardless of the country where the laboratory is located or the type of laboratory (environmental, metal, food, etc). Although the simplification of the LIMS and the standardization of the laboratory production are the primary objectives, the new system must make the jobs of the bench personnel easier to be successful. The Online ELN WorkSheet is an essential add-on tool to any LIMS system and will increase the LIMS value through enhanced functionality and flexibility. Productivity is the key and main reason for incurring the cost and effort of acquiring an Electronic Lab Notebook (ELN). Online Worksheet offers more productivity benefits than any other system of its type. Online ELN Worksheet will protect your LIMS investment by adding flexibility and providing new functionality to your existing system. Online Worksheet will also reduce the cost of new LIMS development by freeing the new system from the complex data handling and instrument interfacing routines. We strongly believe in saving your overall investment in software, training and data automation. We offer maintenance and support programs to ensure that your system will always be up to date with leading edge laboratory software and data automation technology.